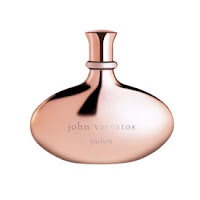 Meant to be tropical and remind wearers of the exotic flowers of a tropical isle, this new and first release for women from John Varvatos disappoints in every way. Firstly, the tropical appeal is lost on me. Instead, what I find is a very cloying, irritating, persistent bouquet that takes prisoners and never lets up. I would expect to find gardenia, tuberose and/or frangipani in a scent dedicated to the tropics. Sadly, none of those flowers bless the composition of this fragrance, for they would be a welcome, softening addition. This scent reminds me of so many that have gone before it, claiming a fantastic addition to floral fragrances available but offering nothing. Save your pennies and instead look for Annick Goutal Songes, Kai or even Fracas. The only redeeming quality about this fragrance is, of course, the bottle. (Remember, it is all about packaging these days. Consumers may be fooled by a great bottle.) Supposedly a grappa bottle served as inspiration for the shape and it is nice enough. However, I encourage you to focus on the juice and in this case, it is unremarkable. A Poll for the Weekend!